Coal was probably the first of the fossil fuels to be used for energy. It was recognized as an energy source by the Chinese around 1100 b.c., while the ancient Greeks were probably the first of the western cultures to be aware of coal. The Romans reported that the "flammable earth" was being mined in Gaul when they captured that section of Europe. The first known coal mines in North America were operated by the Hopi Indians of Arizona some 200 years before Columbus. Coal occurs mainly in the north temperate regions of the earth. Small deposits are located at the poles, but there are almost none in the tropics. The bulk of the world's deposits are located in Siberia in the former Soviet Union 50%) while significant amounts are found in the United States (~ 25%) and China (~ 15%). Coal was formed from the debris of giant tree ferns and other vegetation that grew in swamps and bogs 300 million years ago. When the plants died they were covered with sediment that prevented their oxidation by atmospheric oxygen. Further buildup of sediment and other geological processes subjected these materials to high pressures that resulted in their conversion to the solid, flammable substance we know as coal. There are several classes of coal that reflect different stages in the metamorphosis from the carbohydrate and lignin of plants to the carbon of anthracite coal. Peat, a substance of a low heat value, is formed in the first stage of the process as a result of anaerobic microbial transformations of plant material. The lignin and microbial remains in the peat gradually lose H2O and CO2 as a result of high temperatures and pressures and are converted successively to lignite, bituminous coal, and anthracite. Anthracite, or hard coal, is about 85% carbon, with the remainder being mainly inorganic material and water. 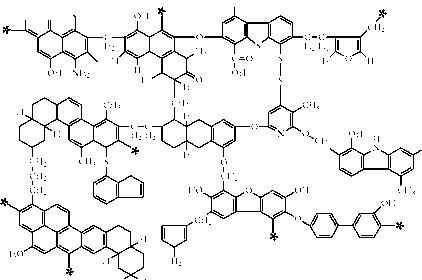 The carbonization of plant carbohydrate results in the formation of a highly condensed aromatic ring structure similar to graphite. Aliphatic rings and chains as well as hydroxyl, carbonyl, carboxyl, and ether groupings are attached to these aromatic structures. Nitrogen, about 1% of the coal, is present as the cyclic amine function and sulfur as thiol (RSH), thioether (RSR), and disulfide (RSSR) groupings. Some of these structural elements are present in the postulated structure for bituminous coal (Figure 6-15). Oxidation of coal by aerobic bacteria removes some of the covalently bound organic sulfur. Coal contains a variety of inorganic ions that ultimately end up in the ash residue after the coal is burned. Some 36 elements were detected in the ash resulting from the burning of West Virginia bituminous coal, with the major constituents being Na, K, Ca, Al, Si, Fe, and Ti. Toxic compounds of arsenic, selenium, and mercury (Section 10.6.7) are released during coal combustion. Pyrite (FeS2), a major source of sulfur in coal, is not bound to the coal but occurs with it. It is formed by the action of anaerobic bacteria that reduce the sulfate in coal to sulfide [see reaction (11-21) in Chapter 11]. The sulfide reduces iron (III) to iron (II) with the corresponding oxidation of sulfide to S2~. 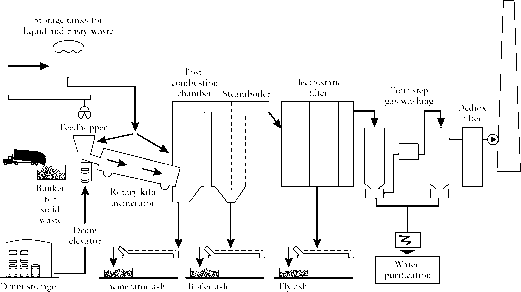 FIGURE 6-15 A postulated partial structure for bituminous (soft) coal. The stars indicate additional connecting points to the polymeric coal structure. Redrawn from N. Berkowitz, An Introduction to Coal Technology, 2nd ed. Academic Press, San Diego, CA. Copyright © 1994. The combination of the two products yields pyrite (FeS2). The total sulfur content of coal is about 0.6-3.2% by weight, with approximately half of that sulfur due to the pyrite present.